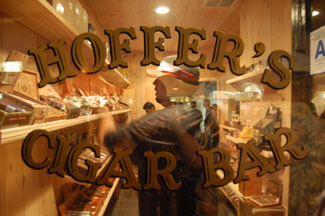 Click on the Hoffer's window to step inside for a VIRTUAL TOUR. Located in the heart of old La Mesa, just 10 minutes from downtown San Diego, Hoffer's Cigar Bar is the place to enjoy your favorite cigar, draft beer, or fine wine. Relax with a drink in our classy smoke free bar, or enjoy your drink with a cigar outdoors on our comfortable heated patio. We offer one of the widest selections of cigars in San Diego County. The cigars are kept in our two walk-in humidor rooms. These cedar-lined rooms use state-of-the-art humidity controls to maintain the freshness of our cigars. Thirsty? Choose from 24 different beers on tap, sip a glass of red or white from our wine menu, or try one of our eight premium ports. Then kick back, relax and watch your favorite sports on our plasma TVs. Hungry? Order food directly from your table using Hoffer's special menu hotline. Some of La Mesa's finest restaurants deliver their food at no extra charge, right to your table. Need to connect? Take advantage of Hoffer's free Wi-Fi service. Want to hear more? Click here to send email to Phil. He'll add you to the email list to keep you up-to-date regarding live music programs, the beer lineup, and special events.